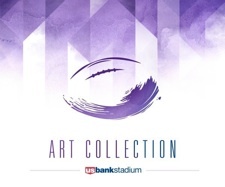 Grimsrud was commissioned to do three paintings for the U.S. Bank Stadium art collection. His theme is “Play Ball Minnesota” featuring some of the sports venues in the Twin Cities. For visual interest, he includes many letters and numbers.